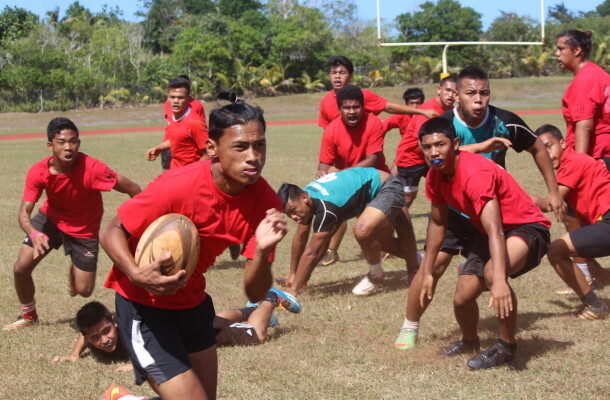 If you have not been watching the IIAAG varsity boys rugby division this year, you may have missed the fact that the Okkodo Bulldogs have strung together three huge performances in as many weeks, and have positioned themselves as a legitimate contender for this year’s title. With big performances by team navigator Mark Lao and speedy winger Jaythaniel Cruz, the Okkodo Bulldogs pushed last year’s runner-up, FD Friars, to the brink in a 34-12 defeat, of which the score would not justify how tough that victory came for the Friars. The Bulldogs took another step forward, forcing the Geckos to salvage a 12-12 draw last weekend. In their third game of the season, the Bulldogs came out against the Southern Dolphins with the clear intent to put their hands up as a real threat, handing the Dolphins a 17-3 defeat. From the opening kick both young squads refused to back down, as fearless runners ran straight into immovable defenses. Early on the Bulldogs appeared to be knocking on the scoring door early, but could not handle Southern’s defensive pressure, resulting in some costly errors. This surprising lack of discipline appeared to signal a bit of a letdown for the host team, but they would recover soon after and then assert their will on the opponents as a big run by Lao into Dolphins territory was capped off by a catch and sidestep by the elusive Cruz, who outraced the field to score. Southern seemed to have responded with a big kick and enough pressure on the Bulldogs, but lost any momentum with a lost ball on the tryline and another penalty that would turn the ball over to Okkodo. Another error by Okkodo gave the Dolphins a bit of hope as captain Napu Topasna successfully kicked a penalty goal just before halftime. As the game continued, Okkodo’s forward pack began to dominate and Arthur Nedlic broke through several tacklers to score a try. On defense the Bulldogs seldom looked out of place and in one instance, a forward pass negated the only real threat of a Southern score. A red card to Dolphins outside center Jerick Navarro left the Dolphins down a man for the remainder of the game, and that was all Okkodo would need as Cruz again raced down the sideline for the final score, and kicked his own conversion, leaving the final score a 17-3. This marks a third, strong consecutive performance by Cruz whose incredible vision and quickness have given opposing teams fits. When commenting on his running performance, Cruz attributed it to his track & field coach, saying, “my coach [has] just told me to keep my focus straight and run hard.” With this streak, Cruz remains a threat to the league and one of Okkodo’s keys to success.